Law no. 32/2001/QH10 of December 25 2001 on organization of the Government đã được thay thế bởi Law No. 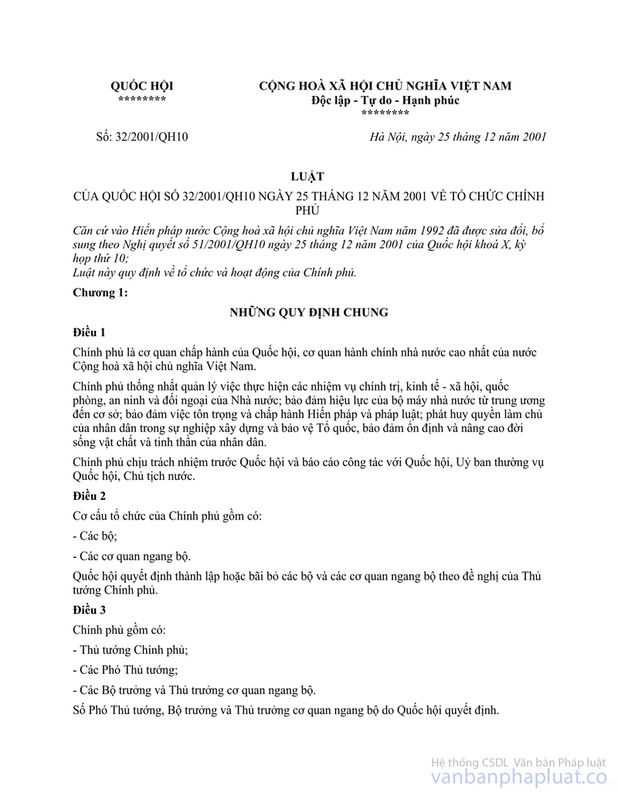 76/2015/QH13 Organizing The Government và được áp dụng kể từ ngày 01/01/2016. This Law provides for organization and operation of the Government. 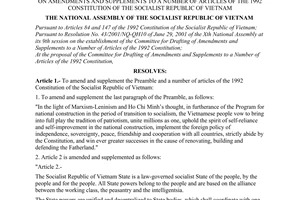 Article 1.- The Government is the executive body of the National Assembly, and is the highest State administrative agency of the Socialist Republic of Vietnam. The Government shall exercise the unified management of the performance of the State’s political, socio-economic, defense, security and external relation tasks; ensure the effectiveness of the State apparatus from the central to grassroots level; ensure the respect for, and the observance of, the Constitution and laws; promote the people’s mastery in the cause of building and defending the Fatherland, thus ensuring stability and improving the people’s material and spiritual lives. The Government shall take responsibility before the National Assembly and report on its activities to the National Assembly, the National Assembly Standing Committee and the State President. The National Assembly shall decide on the establishment or abolition of ministries and ministerial-level agencies at the proposal of the Prime Minister. - The ministers and the heads of the ministerial-level agencies. The numbers of deputy prime ministers, ministers and heads of the ministerial-level agencies shall be decided by the National Assembly. The Prime Minister shall be elected, relieved from office and dismissed by the National Assembly at the proposal of the State President. The Prime Minister shall submit to the National Assembly for ratification proposals on the appointment, removal from office, dismissal and resignation of deputy prime ministers, ministers and heads of the ministerial-level agencies. Based on resolutions of the National Assembly, the State President shall appoint, relieve from office, demote, or approve the resignation of, the deputy prime ministers, ministers and heads of the ministerial-level agencies. Article 4.- The Prime Minister is the head of the Government. The Prime Minister shall be held responsible before the National Assembly and report on his/her work to the National Assembly, the National Assembly Standing Committee and the State President. The deputy prime ministers shall assist the Prime Minister performing tasks assigned by the Prime Minister. 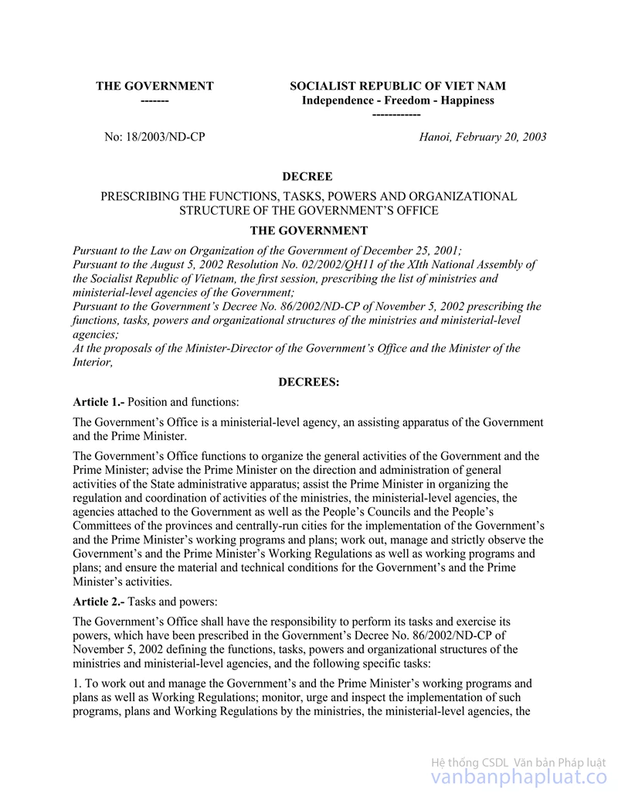 When the Prime Minister is absent, one deputy prime minister shall be authorized by the Prime Minister to direct the activities of the Government on the latter’s behalf. The deputy prime ministers shall be answerable to the Prime Minister and the National Assembly for their assigned tasks. A minister or head of the ministerial-level agency shall be the head and leader of his/her ministry or ministerial-level agency, taking charge of a number of the Government’s activities; and take responsibility before the Prime Minister and the National Assembly for the nationwide State management over a branch or domain or for the jobs assigned to him/her. Article 5.- The Government’s term of office shall correspond to the term of the National Assembly. Upon the end of the National Assembly’s term, the Government shall continue to perform its tasks till the new National Assembly sets up a new Government. Article 6.- The Government shall be organized and operate on the principle of democratic centralism. The efficiency of the Government’s operation is guaranteed by the efficiency of operations of the Government collective, the Prime Minister, and each cabinet member. The Government shall discuss collectively and decide by majority on the important issues prescribed in Article 19 of this Law. The Prime Minister shall lead and administer the Government’s activities and decide on issues prescribed by the Constitution and laws, which fall under his/her jurisdiction. 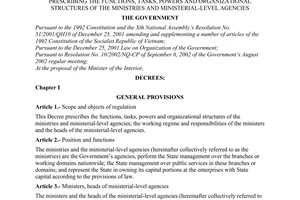 The ministers and the heads of the ministerial-level agencies shall take part in the operation of the Government collective; lead, decide and take responsibility for the branches, domains or work assigned to them; attend the National Assembly’s sessions when the National Assembly examines matters related to the branches, domains or jobs which they are assigned to take charge of. 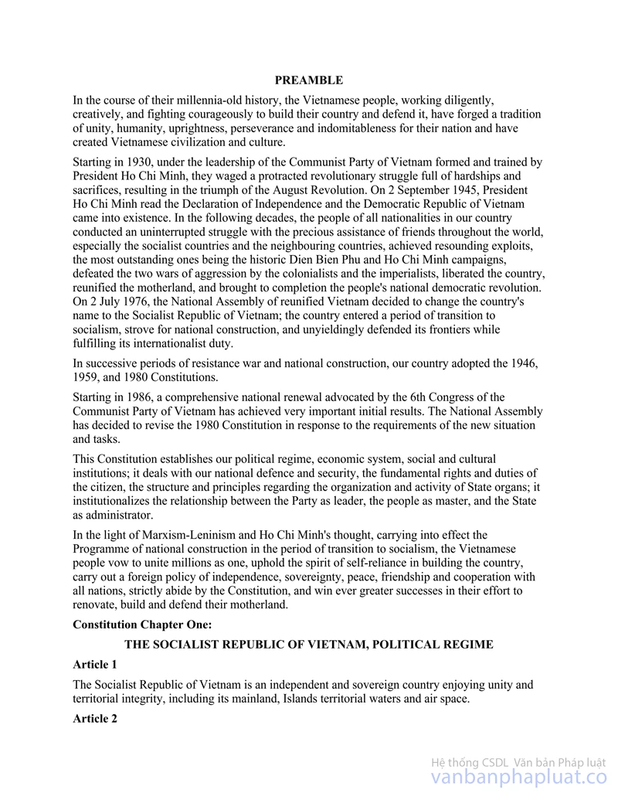 Article 7.- The Government shall perform the function of State management by laws; apply all administrative, economic, organizational, propagation and educational measures; coordinate with Vietnam Fatherland Front’s Central Committee, Vietnam Labor Confederation’s Executive Committee and central committees of mass organizations in the performance of its tasks and the exercise of its powers. 1. 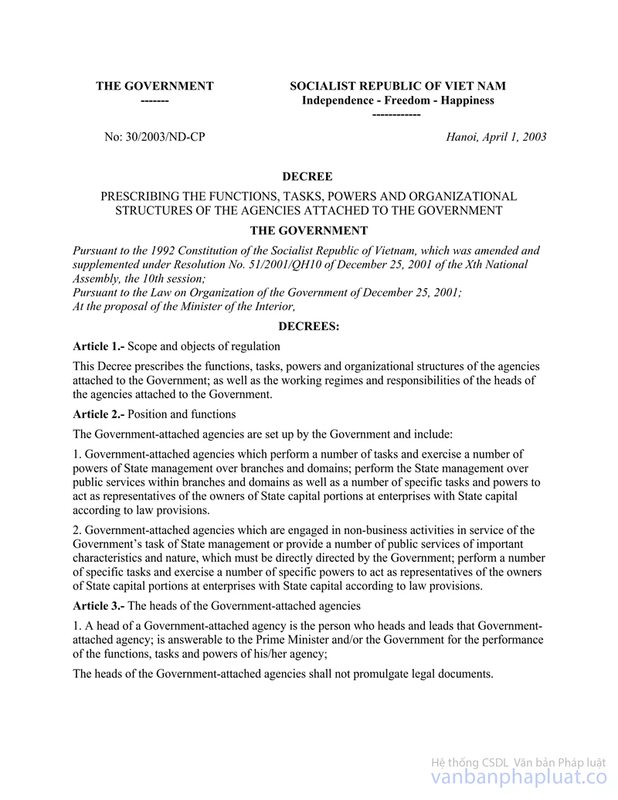 To direct the work of the ministries, ministerial-level agencies and agencies attached to the Government as well as the People’s Committees of all levels, build and perfect a unified system of State administrative apparatus from the central to grassroots level; guide and inspect the People’s Councils in the implementation of documents of the superior State bodies; create conditions for the People’s Councils to perform their tasks and exercise their powers as prescribed by law; train, foster, arrange and use the contingent of State officials and public servants. 7. To organize and direct the State’s inventory and statistical work; the State inspection and supervision work, the fight against corruption and wastefulness and all manifestations of bureaucracy, authoritarianism and bumbledom in the State apparatus; as well as the settlement of citizens complaints and denunciations. 11. To coordinate with Vietnam Fatherland Front’s Central Committee, Vietnam Labor Confederation’s Executive Committee and central committees of mass organizations in performing its tasks and exercising its powers; create conditions for those organizations to operate effectively. 1. To unify the management of the national economy and develop the socialist-orientated market economy; strengthen and develop the State economic sector, attaching importance to key branches and domains in order to ensure its leading role, which shall, together with the collective economy, constitute the firm foundation of the national economy. 8. To unify the management of foreign economic activities, taking initiative in international economic integration on the basis of bringing into play the nation’s internal resources, developing different forms of economic relations with other nations and international organizations on the principle of respect for national independence, sovereignty, mutual benefits, support and promotion of domestic production. 9. To organize and direct the State’s inventory and statistical work. 5. To decide on specific policies for the protection, improvement and preservation of the environment; direct the concentration of efforts on handling the problem of environmental degradation in key areas; control pollution, rescue and overcome environmental incidents. 2. To decide on specific policies for education in order to ensure that the educational development be one of the top national policies; give priority to investment in, and mobilize resources for, development of the educational cause, raising the population’s intellectual level, training human resources, finding out, fostering and using talents. To unify the management of the national education system in terms of education objectives, programs, contents and plans, teachers’ criteria, examination regulations, systems of diplomas and academic titles, types of school and class as well as other forms of education; universalize the basic secondary education and fight the relapse into illiteracy. 3. To unify the management and develop the cause of information and press; apply measures to effectively prevent those information activities which are detrimental to the national interests, destroy the personality, morality and fine life style of the Vietnamese people. 5. To decide on specific policies aiming to boost the development of tourism, making it really a spearhead economic branch, expanding and raising the quality of domestic tourist activities and developing international tourism. 2. To unify the management and develop the cause of caring for and protecting the people’s health, mobilize and organize all social forces for building and developing the medicine of Vietnam; invest in and develop the cause of protecting the people’s health; unify the management over the work of disease prevention and treatment as well as production and circulation of curative medicines, preventing social diseases, implementing health policies and regimes, protecting the people’s health. 7. To organize the application of measures to prevent, fight and preclude accidents and social evils. 2. To decide on specific policies and measures to give priority to all-sided development of ethnic minority areas, building infrastructure, implementing socio-economic development programs and projects, developing the commodity economy, step by step improving the life of people in ethnic minority areas, areas meeting with exceptional difficulties and former revolutionary bases. 4. To implement the policy on religion, ensuring the citizens’ right to freedom of belief, religion or non-religion; ensure the equality among religions before law; combat all acts of infringing upon the right to freedom of belief and religion or acts of abusing beliefs and religions to breach the State�s laws and policies. 3. To organize, and apply measures for, crime and law-violation prevention and fight. 5. To decide on specific policies aiming to encourage overseas Vietnamese to promote the community unity, preserve cultural identities and fine traditions of the Vietnamese nation, maintain close ties with their families and native land, and contribute to building their native places and country; apply measures to protect the legitimate rights and interests of overseas Vietnamese. 1. 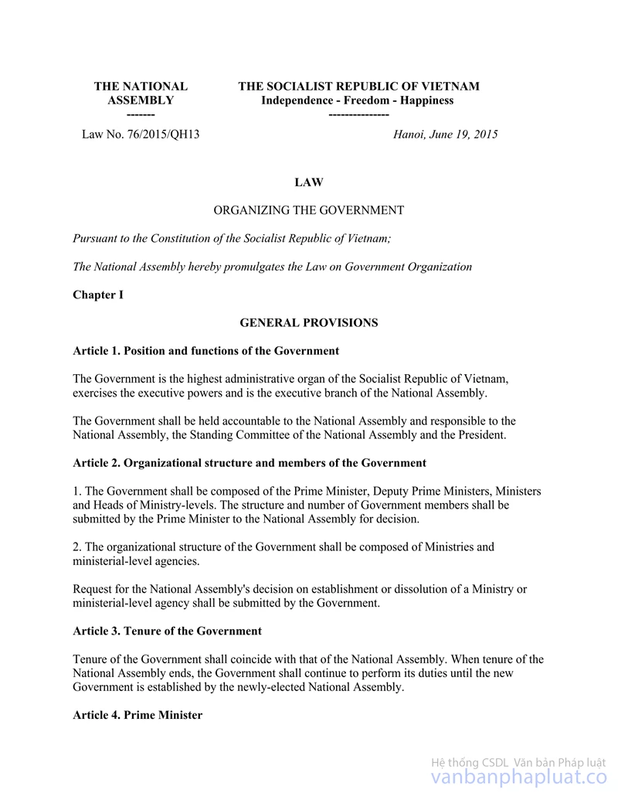 To submit to the National Assembly for decision the Government’s organizational structure, the establishment or abolition of ministries and ministerial-level agencies, the establishment, consolidation, division and re-delimitation of provinces and centrally-run cities as well as the establishment or dissolution of special administrative-economic units. 2. To organize and direct the operations of the system of State administrative apparatus uniformly from the central to grassroots levels; ensure the effectiveness and smoothness of State management in the State administrative system, whereby the subordinate administrative bodies must submit to the leadership, and strictly observe decisions, of the superior administrative bodies. To decide and direct the assignment and decentralization of branch and field management within the State administrative system. 4. To unify the management of officials and public servants in the State agencies from the central to grassroots level; build and train a contingent of State officials and public servants being clean, qualified, capable, loyal to the socialist State and devotedly serving the people; decide and direct the implementation of policies and regimes for training, recruitment, employment, wages, commendation, discipline, retirement and other regimes for State officials and public servants; prescribe and direct the implementation of specific policies for cadres of communes, wards and townships. c/ To ensure material foundations and finance for operations of the People’s Councils. 5. To organize and direct the State inspection work; organize and direct the settlement of citizens’ complaints and denunciations which fall within the Government’s responsibility. 8. The Government’s reports to be presented to the National Assembly, the National Assembly Standing Committee and/or the State President. 9. To observe the regime of reporting to the people on important issues through the Government’s reports before the National Assembly, the Government’s replies to questions of the National Assembly deputies and opinions addressed to the mass media. Article 21.- The Prime Minister shall sign the Government’s resolutions and decrees, issue decisions, directives, and guide and inspect the implementation of those documents by all branches, localities and grassroots units. The resolutions and decrees of the Government as well as decisions and directives of the Prime Minister shall take effect throughout the country. 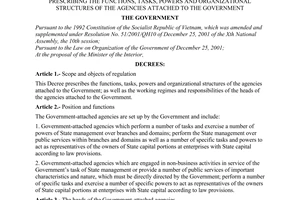 Article 22.- The ministries and ministerial-level agencies are the Government’s agencies, which perform the function of State management over branches or working domains throughout the country; exercise the State management over public services of different branches and domains; and act as representatives of the owner of the State’s capital amounts at State-invested enterprises as prescribed by law. 3. To organize and direct the implementation of plans on scientific research as well as application of scientific and technological advances. 5. To organize the branch-and domain- managing apparatuses according to the Government’s stipulations; submit to the Government for decision the assignment of State management tasks to the local People’s Committees regarding the branch- and domain- managing contents. To propose the Prime Minister to appoint, remove from office or dismiss vice-ministers and equivalent positions. 11. To perform other tasks assigned by the Prime Minister. The tasks and powers of the ministers in charge of a number of jobs shall be provided for by the Government. Article 24.- Basing themselves on the Constitution, laws and resolutions of the National Assembly; ordinances and resolutions of the National Assembly Standing Committee; orders and decisions of the State President as well as documents of the Government and the Prime Minister, the ministers and the heads of the ministerial-level agencies shall issue decisions, directives and circulars, and guide and inspect the implementation of such documents by all branches, localities and grassroots units. The decisions, directives and circulars on State management in different branches and domains, which are issued by the respective ministers and heads of the ministerial-level agencies, shall take effect for implementation throughout the country. Article 25.- The ministers and heads of the ministerial-level agencies shall guide and inspect the ministries, ministerial-level agencies and agencies attached to the Government in the latter’s performance of the tasks in the branches or domains under their respective management. The minister or head of a ministerial-level agency shall have the right to propose another minister or head of the ministerial-level agency to stop the implementation of, or annul, regulations issued by the latter, which are contrary to the legal documents of the State or ministry, ministerial-level agency on the branch or domain managed by his/her ministry or ministerial-level agency; if the proposal receiver disagrees, the proposal may be submitted to the Prime Minister for decision. 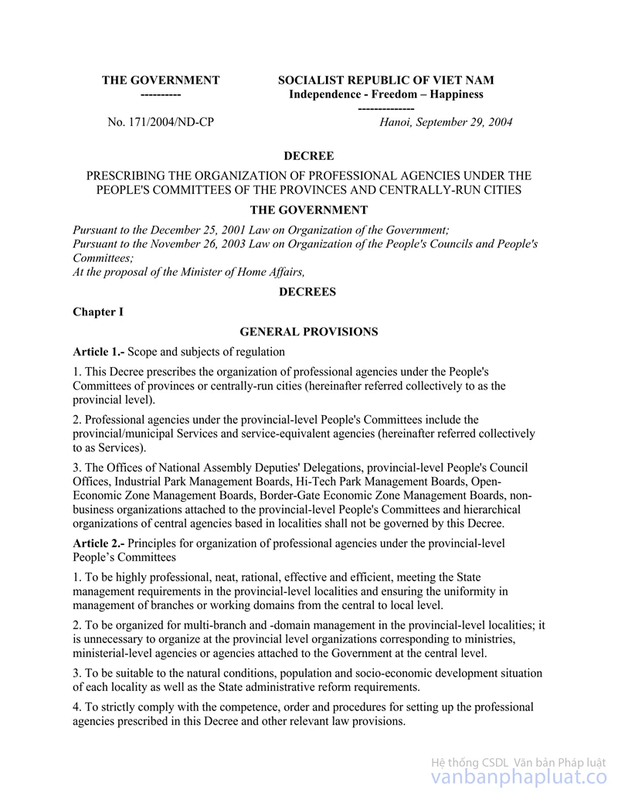 Article 26.- The ministers and heads of the ministerial-level agencies shall have the right to propose the Prime Minister to stop the implementation of resolutions of the People’s Councils of the provinces and centrally-run cities, which are contrary to the legal documents of the State, ministries or ministerial-level agencies on the branches or domains under their management. Article 27.- The ministers and heads of the ministerial-level agencies shall direct, guide and inspect the People’s Committees at all levels in the latter’s performance of the tasks in the branches or domains under their management. 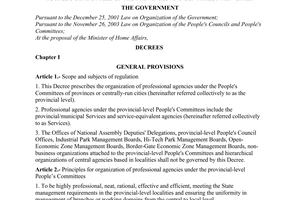 The ministers and heads of the ministerial-level agencies shall have the right to stop the implementation of, or request the Prime Minister to annul, regulations issued by the People’s Committees and presidents of the People’s Committees of the provinces and centrally-run cities, which are contrary to the documents of ministries or ministerial-level agencies regarding branches or domains under their respective management, and shall take responsibility for such decisions; if the People’s Committees of the provinces or centrally-run cities disagree with the implementation-suspending decisions, they shall still have to execute them but may lodge their motions to the Prime Minister. 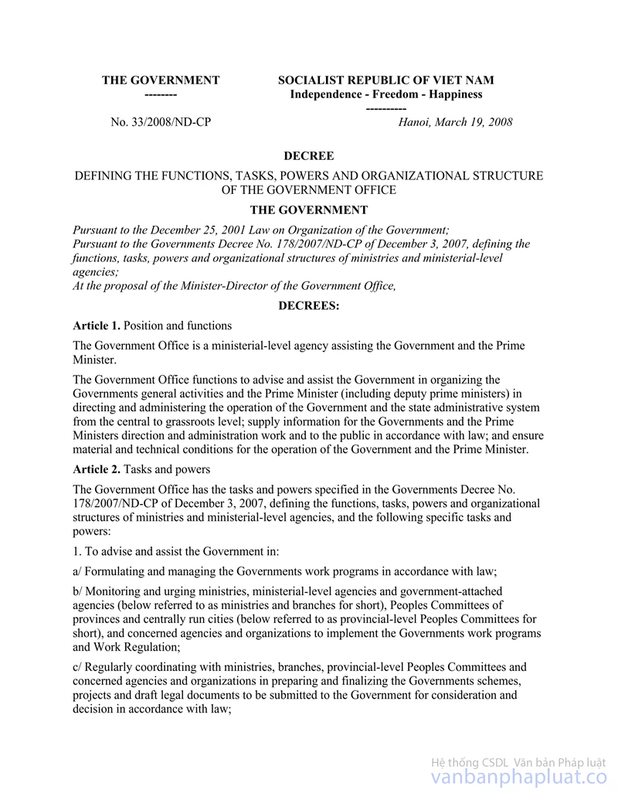 Article 28.- The ministers and the heads of the ministerial-level agencies shall have to coordinate with one another in preparing joint schemes to be submitted to the Government and the Prime Minister; issue joint-circulars in order to direct and guide the performance of tasks, which fall under their State management functions. 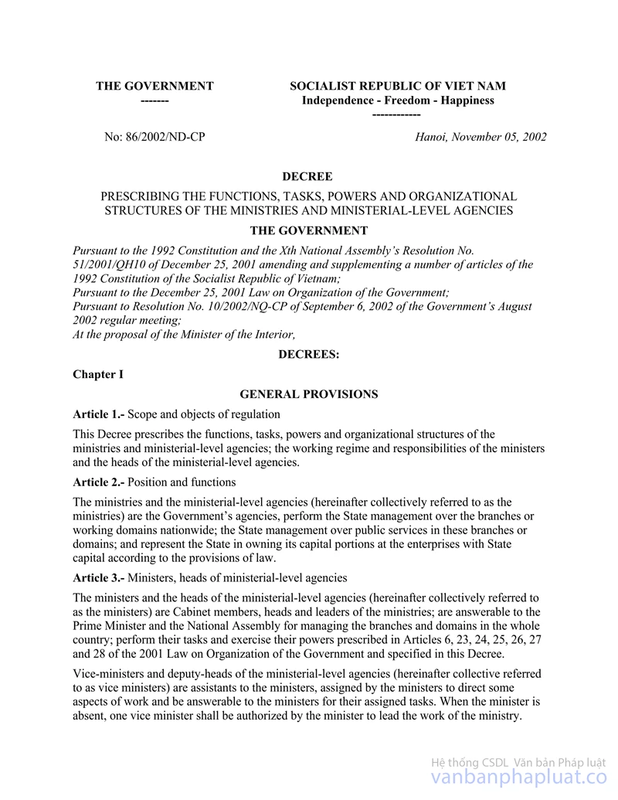 Article 29.- The vice-ministers and the deputy-heads of the ministerial-level agencies shall assist the ministers and the heads of the ministerial-level agencies, be assigned to direct a number of activities, and take responsibility before the ministers and the heads of the ministerial-level agencies. 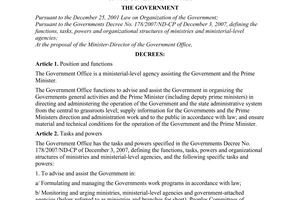 When a minister or a head of a ministerial-level agency is absent, a vice-minister or a deputy-head of the ministerial-level agency shall be authorized to direct the work of that ministry or ministerial-level agency. Article 30.- The Government Office is the assisting apparatus of the Government, headed by the Minister-Director of the Government Office. The tasks, powers, organizational structure and operations of the Government Office shall be provided for by the Government. Article 31.- The heads of the agencies attached to the Government shall perform tasks and exercise powers according to the Government’s stipulations; and take responsibility before the Government and the Prime Minister for their assigned tasks and vested powers. Article 32.- The Government works according to the regime of combining the collective’s responsibilities with the promotion of powers and personal responsibility of the Prime Minister as well as each cabinet member. Article 33.- The form of operation of the Government’s collective is the Government’s meeting. The Government shall meet regularly once every month. The Prime Minister shall convene the Government’s irregular meetings by his/her decisions or at the request of at least one-third of the total number of cabinet members. Article 34.- The cabinet members shall have to attend all the Government’s meetings; in case of their total or partial absence from a meeting, the Prime Minister’s consent is required. The Prime Minister may allow the cabinet members to be absent from the Government’s meetings and to appoint their deputies to attend such meetings. When necessary, the heads of the agencies attached to the Government, the presidents of the People’s Committees of the provinces and centrally-run cities may be invited to the Government’s meetings. Attendants of the Government’s meetings, who are not cabinet members, may voice their opinions but may not vote. Article 35.- A Government’s meeting shall be held only when it is attended by at least two-thirds of the total number of cabinet members. At the meetings to discuss important issues prescribed in Article 19 of this Law, the Government’s decisions must be voted for by more than half of its members. In cases where the vote for and the vote against are equal, the Prime Minister’s opinion shall be complied with. 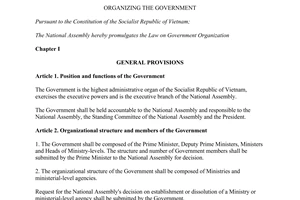 Article 36.- The legal documents issued by the Government, the Prime Minister, the ministers or the heads of the ministerial-level agencies must be promulgated within the prescribed time limits and published in the Official Gazette of the Socialist Republic of Vietnam, except for legal documents with State secret contents. Article 37.- The Prime Minister shall authorize the Minister-Director of the Government Office to regularly notify the mass media agencies of the contents of the Government’s meetings and decisions of the Government and the Prime Minister. Article 38.- The Government shall invite the State President to attend its meetings; and submit to the State President for decision issues falling under the latter’s jurisdiction. The Government shall invite the chairman of the National Assembly’s Nationality Council to attend its meetings to discuss the implementation of nationality policies. Quarterly and bi-annually, the Government shall send reports on its activities to the State President and the National Assembly Standing Committee. At the National Assembly’s mid-year session, the Government shall send reports on its activities to the National Assembly deputies. At the National Assembly’s year-end session, the Government shall report before the National Assembly on its activities. When requested by the National Assembly Standing Committee, Nationality Council or Commissions, cabinet members shall have to present or provide necessary documents. The Prime Minister or cabinet members shall have to answer the motions put forth by the National Assembly’s Nationality Council or Commissions within 15 days after receiving them. The Prime Minister or cabinet members shall have to answer questions of the National Assembly deputies as prescribed by the Law on Organization of the National Assembly. 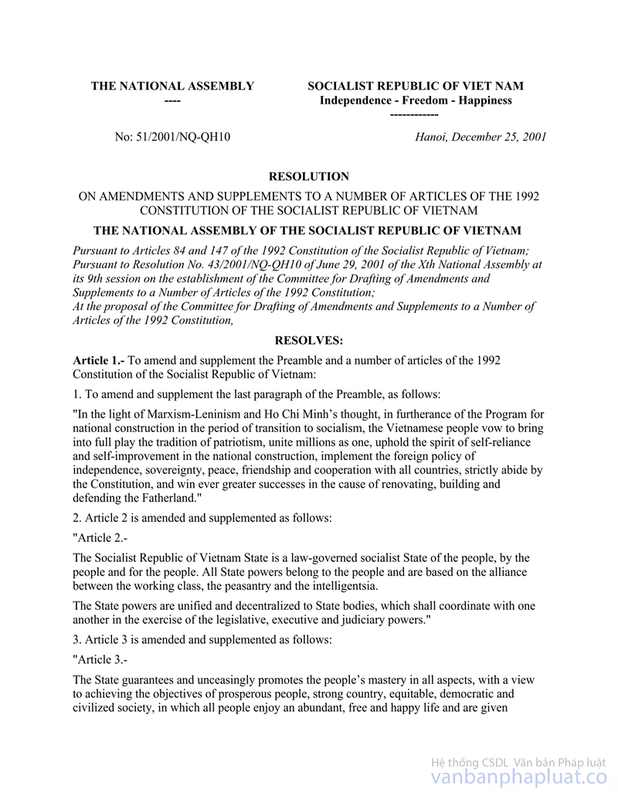 Article 39.- The Government shall coordinate with the Central Committee of Vietnam Fatherland Front, the Executive Committee of Vietnam Labor Confederation and the central committees of mass organizations while performing its tasks and exercising its powers and organize and direct the mass movements for the performance of important political, socio-economic, defense, security and foreign tasks. 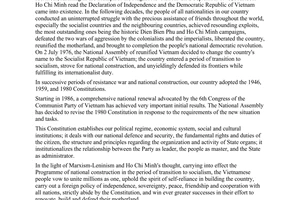 The Government shall, together with Vietnam Fatherland Front’s Central Committee and Vietnam Labor Confederation’s Executive Committee as well as the central committees of mass organizations, elaborate specific regulations on their working relationships. The Government shall invite the president of the Presidium of Vietnam Fatherland Front’s Central Committee, the president of Vietnam Labor Confederation and the heads of the central committees of mass organizations to attend its meetings for discussion of relevant issues; regularly notify Vietnam Fatherland Front’s Central Committee, Vietnam Labor Confederation’s Executive Committee and central committees of mass organizations of the socio-economic situation as well as the Government’s major decisions, undertakings and tasks. When drafting laws, ordinances as well as resolutions and decrees, the Government shall send the drafts thereof to Vietnam Fatherland Front’s Central Committee, Vietnam Labor Confederation’s Executive Committee and central committees of mass organizations for comments. The Government shall create favorable conditions for Vietnam Fatherland Front, Vietnam Labor Confederation and mass organizations to propagate and disseminate the legislation among population, encourage and organize people to participate in the building and strengthening of the people’s administration, organize the implementation of the State’s undertakings, policies and laws and supervise activities of the State agencies, people-elected deputies as well as State officials and public servants. The Government and its members shall have to study, settle and respond to proposals of Vietnam Fatherland Front, Vietnam Labor Confederation and mass organizations. Article 40.- The Government shall coordinate with the Supreme People’s Court and the Supreme People’s Procuracy in the struggle to prevent and preclude crimes and violations of the Constitution and laws, thus firmly maintaining the State’s discipline and laws, achieving socio-economic targets and materializing the State’s undertakings and policies. The Government shall invite the chief judge of the Supreme People’s Court and the chairman of the Supreme People’s Procuracy to attend its meetings for discussion of relevant issues. Article 41.- The Government’s operation funds shall be decided by the National Assembly and be channeled from the State budget. Article 42.- This Law replaces the September 30, 1992 Law on Organization of the Government. All the earlier provisions contrary to this Law are hereby annulled. Article 43.- The Government shall detail the implementation of this Law. This Law was passed by the Xth National Assembly of the Socialist Republic of Vietnam on December 25, 2001 at its 10th session. Decree No. 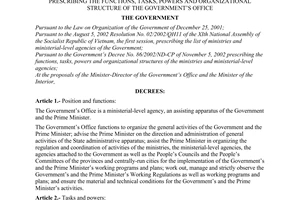 33/2008/ND-CP of March 19, 2008, defining the functions, tasks, powers and organizational structure of the Government Office.